Known as the Emerald of the Atlantic, Fernando de Noronha Archipelago is a paradise for sun and sea lovers. Clear waters, nature untouched by man and marine life that enchants tourists from all over the world, Noronha is, without a doubt, one of the natural wonders of the planet. A perfect place for diving, the archipelago has an excellent infrastructure for the practice of this sport. Noronha is also the right place for those who like trails and adventures. Since the entire archipelago is a Natural Heritage of the World (UNESCO), there are no resorts there. However, the available inns are excellent. Some of them have even been chosen by specialized magazines as among the best in Brazil. "This is heaven," wrote Amerigo Vespucci in 1503 upon arriving on the shores of the Fernando de Noronha Archipelago. The Italian explorer was part of an exploratory Portuguese expedition led by Gonҫalo Coelho and financed by the nobleman Fernão de Loronha. In the five hundred years that followed, the breathtaking natural beauty of this isolated archipelago inspired similar awe and fascination in successive waves of invaders from Portugal (beginning in 1503), the Netherlands (1629), and France (1736), and continues to inspire tourists and Brazilians alike today. The 15-kilometer long, 3.5-kilometer-wide string of 21 islands that comprise Fernando de Noronha Archipelago float far out in the Atlantic off the coast of Brazil, 350 kilometers (220 miles) east of Natal and 550 kilometers (340 miles) east of Recife. 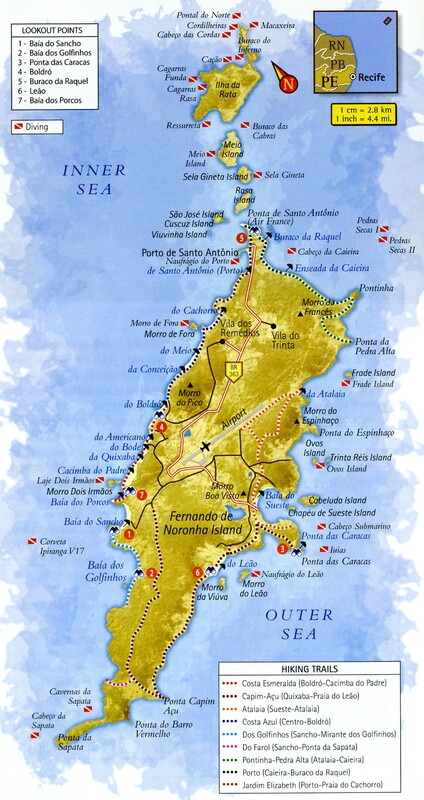 In the 18th century, a prison was built on the largest island, which is also called Fernando de Noronha. The island's and archipelago's namesake is a corruption of the name of the nobleman who was granted the territory by the crown. In 1988, 85% of the island became a National Marine Reserve, and in 2001, Unesco declared it a World Heritage site. As such, the number of visitors to the island is now limited. Each visitor is also required to pay a hefty environmental protection fee; the amount is determined by the length of their stay (a week is typical). There are two daily flights to Fernando de Noronha from Natal or from Recife; travelers can also reach the islands on one of the cruise ships (like the Pacific) that stop at the islands between October and February. Once on the island, favored modes of transportation are buses (which every half hour run around the island, starting from Vila dos Remedios, the main village center), rented motorcycles, and rented buggies. The main road across the island is BR-363 highway, the shortest federal highway in the country at only 6.8 kilometers (4 miles) long. There is only one bank and no currency exchange bureau on the island. As prices at local markets are high, it is better to bring any provisions you might need with you from the mainland. Vila dos Remédios is the island's main urban center. It sprang up in the late 1700s around the Igreja de Nossa Senhora dos Remedios, still the center of town and now an Iphan-protected historical site. Every year on August 29th, the church hosts a lively festival honoring the Virgin Mary, patron and protector of the village. Year-round, locals and visitors alike gather at the stores, cafes, and bars surrounding the church, like the popular Bar do Cachorro. Behind the church are the ruins of the Fortaleza de Nossa Senhora dos Remédios, one of ten coastal fortifications built by the Portuguese in the 18th -century. Other notable buildings in the village include the Palácio de São Miguel palace, Noronha's administrative center, and the Memorial Noronhense, a museum chronicling the archipelago's history. Though Remedios is small, it has adequate facilities for travelers, including ten restaurants and roughly 105 guesthouses, which are local residences that rent rooms to travelers. The waves create the most tubular shapes in November and April, making those months the best for surfing on the beaches facing the mainland (mar de dentro), especially Praia do Boldró and Cacimba do Padre. January brings "national and international surfing championships to the island. August draws fishing enthusiasts with the Torneio de Pesca Oceanica, a nation deep-sea fishing tournament. Angling is allowed year-round, but onIy outside the limits of the special Marine Reserve area. Fishermen report catching barracudas, Marlins, and sailfish on the island. The two Regatas Oceanicas Internacionais (international sailing regattas), Recife-Noronha and Noronha-Natal, are held here every September. Along much of Noronha's coastline you can see cliffs ringed by rocky beaches, the result of years of coral, shell, and volcanic rock sedimentation. The portion of the island closest to the Brazilian mainland is referred to as "mar de dentro" (inner sea), while the easternmost reaches are known as "mar de fora" (outer sea). The eleven beaches on the IIlar de dell fro side are better protected from ocean winds, meaning their waters are calmer and better for snorkeling. Among the most popular of these beaches is Baia do Sancho. Sea turtles come ashore at Sancho to lay their eggs, so access is restricted from 6pm to 6am in hatching season (January to July). Also popular on the mar de dentro side of the island are: Baia dos Porcos, where reefs form natural pools teeming with fish; Praia do Cachorro and Praia do Meio, the busier beaches closest to Remedios; and Praia de Santo Antonio, where divers can visit the wreckage of the Greek ship Eleani Sthathos. On the mar de fora side of the island is Praia do Atalaia, with its sea full of colorful fish. Access is restricted to 100 visitors per day. Groups of 25 are admitted every 20 minutes beginning at low tide. The long Praia do Leão beach faces Ilha da Viuvinha island. Swimming can be dangerous here at high tide because of the rocky shoreline. Leão is a bird sanctuary and sea turtle hatching ground, so access is restricted as at Baia do Sancho. Baia do Sueste is home to the ruins of the Forte de São Joaquim. The beach is accessible by the island's only paved road. The beauty of the underwater life surrounding Noronha makes masks and snorkels essential travel gear. Sancho Bay and the beaches of Atalaia, Boldro, and Conceiҫão are some of the best snorkeling spots on the island. The so called "planasub" is another popular option for wildlife viewing. Invented in Noronha in 1997 by fishing engineer Leonardo Bertrand, this transparent acrylic board is used by snorkelers being pulled along by a motorboat through the water, acting as a support while still allowing unobstructed views. Planasub trips usually last for one hour, pulling visitors across the water for roughly 4 kilometers. A favorite destination for scuba divers, the waters of Fernando de Noronha boast a wealth of marine life, with countless species of fish, sharks, rays, and eels darting among colorful coral formations. There are 16 diving spots to choose from on Noronha, all with crystal-clear waters and all with undenwater visibility of around 50 meters (165 feet). Certified divers have the option of diving down 63 meters (207 feet). Children aged 10 years and older can take 30-minute, is-meter (50-foot) dives accompanied by an instructor. Boat trips are an excellent way to see the unique and colorful landscape of the archipelago for yourself. Boats make the 3-hour trip around the island daily, leaving from Praia do Porto up the west coast of the Fernando de Noronha island, to Ponta da Sapata. Trips depart both early in the morning and in the afternoon. Guides point out the most interesting spots and offer a detailed history of the region. The undisputed highlight of the trip is Baia dos Golfinhos (Dolphin Bay), where spinner dolphins (Stenella Longirostris) usually make an appearance. Travelers also have the option of taking guided two-person kayak toms to Cacimba do Padre, at the limits of the Marine Reserve (a roughly 2 hour trip). Thankfully, a motorboat tows the kayaks behind it on the return journey to Vila dos Remedios, so there's no need to paddle upwind. Dedicated to the protection of sea turtles, Projeto Tamar is one of the most successful environmental initiatives in Brazil. The Tamar team gives lectures on everything from turtles to dolphins every day at 9pm at the Centro de Turismo do Projeto Tamar (Tamar Project visitors center) and the Centro de Visitantes do Parque Nacional Marinho (National Marine Reserve Visitors Center) both coordinate special events and lead guided tours of the turtle hatchings. There are nine main hiking and biking trails on Fernando de Noronha, offering visitors access to the island's 16 unrestricted beaches and seven lookout points. Costa Esmeralda (3 kilometers long), runs from Boldro to Cacimba do Padre beaches, and is one of the most popular treks on the island. Capim-Aҫu (10 kilometers) is the island's longest trail , crossing from Quixaba to Praia do Leão beaches. Atalaia starts at Sueste and crosses the only island mangrove swamp in the Atlantic. Costa Azul (2 kilometers), accessible only at low tide, starts at the center of the village of Remedios, passes Morro do Pico hill, and ends at the Mirante do Boldro lookout. Trilha dos Golfinhos (2 kilometers) starts at the Mirante do Sancho and passes the ruins of São João Batista and the Morro dos Dois Irmãos hill en route to the 70-meter-high Mirante dos Golfinhos. Trilha do Farol is just 2.5 kilometers long but very steep, rising sharply up from Sancho Bay to Mirante do Farol at Ponta da Sapata. Pontinha-Pedra Alta (3 kilometers) runs from Atalaia to Caieira beach. Porto, a very short trail near the port, runs from Caieira to Buraco da Raquel. Jardim Elizabeth follows the Estrada Velha do Porto road to Praia do Cachorro.